Helping colleagues learn how to create blended onsite-online learning spaces by actually creating blended onsite-online learning spaces is an exercise we are far from exhausting, as I saw once again while facilitating a session at the American Library Association (ALA) 2015 Annual Conference here in San Francisco a month ago. Being able to foster this sort of blended interaction seems to me to be another critically-important digital-literacy skill along the lines of what colleagues are exploring in our ALA Editions “Rethinking Digital Literacy” course; is not at all difficult or costly to do if we creatively use tech tools readily available to many of us; and actually becomes a fun and engaging way for many of us to extend the size of the learning spaces we typically inhabit, we again saw during that “Blend It” session sponsored by ALA’s Library and Information Technology Association (LITA). The concept, which I’ve explored with colleagues in a variety of settings, is straightforward: using little more than a laptop with a webcam, a projector and screen, and some form of audio system (either a small, portable set of speakers or a connection to an existing sound system within the onsite space that serves as the anchor for our efforts), we create real-time multiple levels of communication between learners/colleagues in a physical setting and colleagues who join us via their own online access points anywhere in the world. This quickly transforms those offsite learners/colleagues from being part of a “left behind” group to being active participants in a learning space that can be thousands of miles wide if those colleagues come from a variety of countries. What makes this personally rewarding for all involved is that we continue to learn through experimentation. The earliest effort I was lucky enough to help design and facilitate used Skype as the tool uniting an offsite presenter with approximately 200 colleagues here in San Francisco for a dynamic and tremendously rewarding exchange. The experiments continued a few years later when two colleagues and I used Skype and Twitter to connect onsite and online participants in a wide-ranging conversation about how we could incorporate these tools and these blended spaces into effective learning spaces. New Media Consortium colleague Samantha Adams Becker and I continue to push this particular learning envelop via Google Hangouts in a variety of settings, so I was ready, at the ALA Annual Conference this year, to carry it a step further by adding a “bring your own device” element to the conversation. After introducing onsite participants to the concepts we were exploring, Harford County Public Library tech trainer Maurice Coleman and I demonstrated the concept by having Maurice step outside the room, use his own smartphone to join a Google Hangout I had started with my own laptop and was projecting onto a large screen that everyone in the room could see, and carry on a brief conversation that those in the room could join by addressing questions to him via the microphone that was embedded in the laptop. The magic moment came when he physically returned to the room—it’s worth noting that by remaining visible and audible via that smartphone, he had never really left the room or the conversation—and we offered onsite participants a challenge: quickly identify someone you know could not be here at the conference, try to reach them using your own mobile device, and bring them into the room now via a Google Hangout. It was learning at its best: those unfamiliar with Hangouts helped others try to set up individual sessions; those familiar with Hangouts tried to initiate their own. And those who were successful let the rest of us know that had eliminated another member of the “left behind” corps through that virtual contact. At its peak, we had nearly a dozen individual hangouts happening simultaneously, and those in the room completely made the learning space their own: some explained to their friends what they were doing and what others were accomplishing; a few kept those sessions live for the remainder of the time we had together. And one particularly creative learner left her seat and gave her offsite colleague a virtual tour of the room by walking around and introducing our offsite colleague to others who were onsite. It may have been gimmicky. It may have been far from pretty. But it was an exploration of digital literacy and educational technology at work in a way that provided a visceral example of how far we literally have come together. How easy it is for us to foster those levels of training, teaching, learning, and collaboration when we’re not afraid to risk failure in seeking small and large successes. And how easy it is to have fun while creating memorable, meaningful learning experiences that will continue spreading long after that formal session ended. N.B. 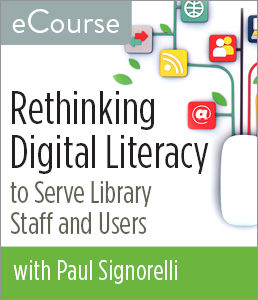 – This is the fourth (and final) in a series of reflections inspired by the American Library Association 2015 Annual Conference in San Francisco and the fifth in a series of reflections inspired by our ALA Editions “Rethinking Digital Literacy” course. Joining the hour-long discussion about pursuing careers in training-teaching-learning today on the latest episode of Maurice Coleman’s T is for Training once again helped make something obvious to me: it’s all about love. You could hear, as each one of us on the audio recording described how we began working as trainer-teacher-learners in library settings, the same theme that runs through most conversations I have with colleagues engaged in designing and facilitating learning opportunities onsite and/or online throughout the world: we really love what we do. We love the opportunities the work provides for us to make a difference among the learners we serve and the patrons-customers-clients those learners ultimately serve. We love the shared sense of achievement we have with learners when our efforts help them become better at or more knowledgeable about something they wanted to pursue. We love the never-ending challenge of having to learn new things so we can stay at least a couple of steps ahead of those we serve. And we love the fact that many of us involved in workplace learning and performance (staff training) found our way into the profession in ways other than through overt decisions. It’s not as if any of us can remember a conversation in a kindergarten playground that included the words, “When I grow up, I’m going to be a trainer,” much less the even more specific, “When I grow up, I’m going to work in staff training for libraries.” One T is for Training colleague, in fact, noted that she did pursue an academic degree in teaching elementary-school students before realized she didn’t even like other people’s children—a somewhat discouraging obstacle to her initial plans; my own feeling is that we’re tremendously fortunate that she found a more compatible audience in the adult learners she so effectively serves today. For those of us in the T is for Training conversation and for numerous other colleagues with whom I’ve had this conversation, training-teaching-learning was something that came our way when a colleague or an insistent manager or supervisor told us that we seemed to have an ability to help others learn what they have to learn, assured us that we “talk real pretty,” and decided that we would be great at designing and delivering learning opportunities for others. After the initial elation of being acknowledged for being good at anything at all began to subside, we generally were overcome by sheer terror when we realized we had very little formal training in how to help others learn, so we spent the next few years scrambling to absorb everything we possibly could about a subject and a skill we were supposed to have already mastered. It is, during that catching-up-to-be-where-we-were-supposed-to-be-yesterday process, that love sets in. We love the fact that we discover many colleagues who not only have suffered through this “Great! I’m a trainer. Now what do I do?” experience but who are also quite willing to share tips and experiences and resources. If we’re in libraries, we discover that the American Library Association has plenty of groups that include our best training-teaching-learning colleagues, e.g., the Learning Round Table, the Library and Information Technology Association (LITA), and the Library Instruction Round Table (LIRT). If we’re engaged in exploring ways to effectively use educational technology to support learning, we find plenty of wonderfully innovative (and very patient) colleagues in the New Media Consortium. If we are looking for a global learning organization comprised of colleagues in training-teaching-learning, we find a first-rate professional family in the Association for Talent Development (formerly ASTD, the American Society for Training & Development). That love of training-teaching-learning extends to a love of sharing our enthusiasm with those who may be following in our footsteps sooner than later, as was clear when we discussed tips for those currently earning the academic degrees necessary for successful careers within libraries. Not surprisingly, we all encouraged current MLS/MLIS students to pursue any opportunity available to take courses about training-teaching-learning. The less-obvious advice that we consistently offered was to “take initiative and be creative” in seeking and developing those opportunities. If an information-school program isn’t specifically offering courses in the fundamentals of teaching and learning or isn’t offering courses in instructional design (and this appears to be a huge gap in most programs I’ve explored), students can shape those learning experiences by seeking a willing faculty member who will oversee independent, semester-long individual-study projects that allow the student to learn by creating his or her own curriculum that results in a concrete final project which, in turn, may be publishable—a winning situation in that the learner gains recognition for the effort expended, and the entire community of learning has grown through the addition of what that project documents and suggests. Although our T is for Training conversation didn’t explicitly move in this direction, it could easily have included suggestions that those seeking careers in training-teaching-learning (and those needing new, engaging, inspiring trainer-teacher-learners) work to establish formal mentorships and apprenticeships. It’s obvious to my colleagues and to me that lifelong learning is an essential element to success in contemporary workplaces, and it’s obvious to me that our commitment to lifelong learning is what makes us competitive—and useful to those we serve. The more we can do to draw people into the ever-evolving world of training-teaching-learning, support them in their growth as part of our own professional growth process, and draw them into our professional associations (e.g., ALA and ATD) as well as our formal and informal onsite and online communities of learning, the more successful we all will be. And the more love we’ll have to share.